How should we conduct economics in an era of climate change, natural resource depletion and population increase? These issues are systemic, and involve great uncertainties and long time horizons. This book contends that the free-market economics that has dominated capitalist democracies in recent decades is not up to the task; that the welfarist economics that preceded it, while preferable, also has inadequacies; and that what is required is an economics founded on ecological principles, greater respect for the laws of natural science, and a moral commitment to a sustainable future. The book commences with an exposition of major aspects of orthodox macroeconomic and microeconomic theory. It then explores the bounds of orthodox theory in relation to ethics, liberalism, ideology, society, the international economy, globalization, and the environment, and seeks lessons for a future economics. Issues raised by natural resource use and climate change are given particular prominence. Many of the issues of critical importance in coming decades involve not private goods but public goods: goods which markets are ill-equipped to deal with. In the resolution of these issues political processes will need to be engaged. The availability to each individual of clean air, clean water and adequate sustenance, goods which cannot be provided for by economic production alone, are of central concern. While acknowledging the importance of market processes, the author argues in favour of a more deliberative and democratic economy, the greater engagement of civil society, environmental human rights and responsibilities, and in favour of a World Environment Organization, change in the conduct of the World Trade Organization, and for economists to accept moral responsibility for the policies they advocate. Specific case studies are given and potential policies outlined. This book will be of interest not only to economists but also to citizens generally and students concerned with public affairs. 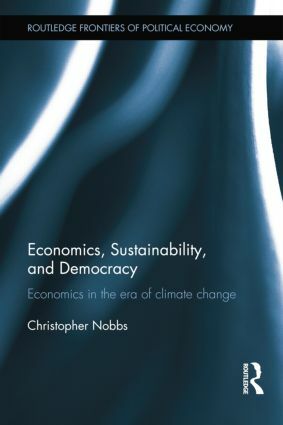 'Nobbs has provided a scholarly and well referenced integration of economic theory with ethics, all within the context of ecological economics and the biophysical limits to the scale of the human economy, most specifically exemplified by climate change. A fine contribution to building bridges between different modes of thinking.' — Herman E. Daly, Professor Emeritus, School of Public Policy, University of Maryland, USA. Christopher Nobbs has enjoyed a diverse career, including posts as a researcher in molecular biology at the University of Cambridge, as a consultant and administrator at the OECD Environment Directorate, as economist to the Government of Victoria’s salinity control programme, and as co-director of an Australia-wide social research consultancy. His abiding professional interest has been in issues at the intersection of science, economics, and politics, particularly as they relate to the environment. He is a graduate of the Universities of Auckland, London and Cambridge. Why not download our Routledge FreeBook Environmental and Ecological Economics? This resource contains a chapter from Economics, Sustainability and Democracy, along with along with a selection of excerpts from our other titles in this field.